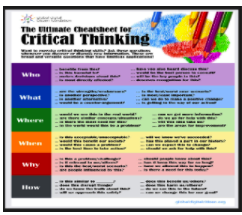 Critical thinking is a disruptive cognitive process that explores alternative ways of thinking about something with the purpose of uncovering silent and untold meanings. Critical thinkers do not settle with the obvious and the taken for granted. They always delve into the deep layers of meaning and engage in profound intellectual altercations to formulate a better and holistic understanding. In a world where information obesity is the norm, critical thinking skills become essential survival skills. They, and only they, can make a whole difference between information and disinformation.